This page is for those adventurous persons who wish to setup The Settlers II by themselves without paying for GOG.com’s version (which runs the game via preconfigured DOSBox). In this case you already own the game on a CD and are not willing to pay again, or maybe you wish to try out a demo version before rushing things and buying a copy from GOG.com. 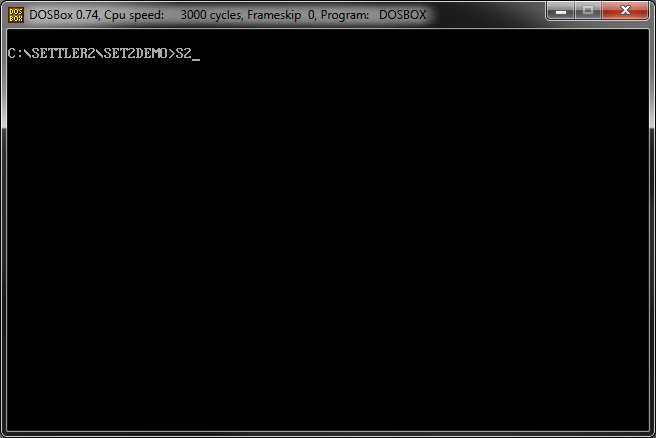 Note that DOSBox running on Windows 7 and Vista may have issues with CD-ROM access. In that case you can create an image out of your game CD using tools such as ImgBurn. 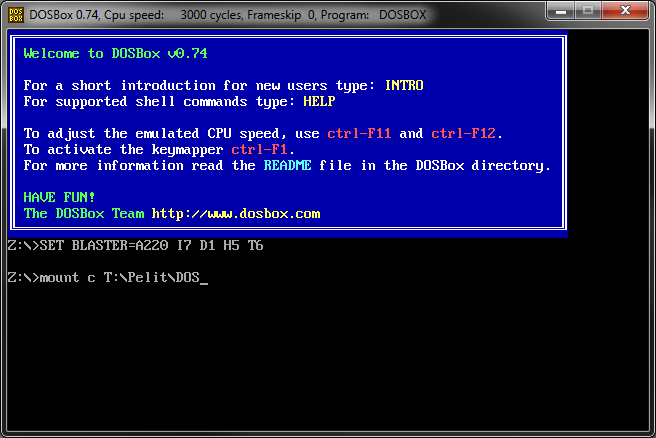 Once you have installed DOSBox and are running it you may wonder what to do. So here is how I got the original The Settlers II demo version 1.02 running on my computer. Then you can move to the newly mounted drive C by typing C:, and then move to the directory where you have your version of Settlers II. 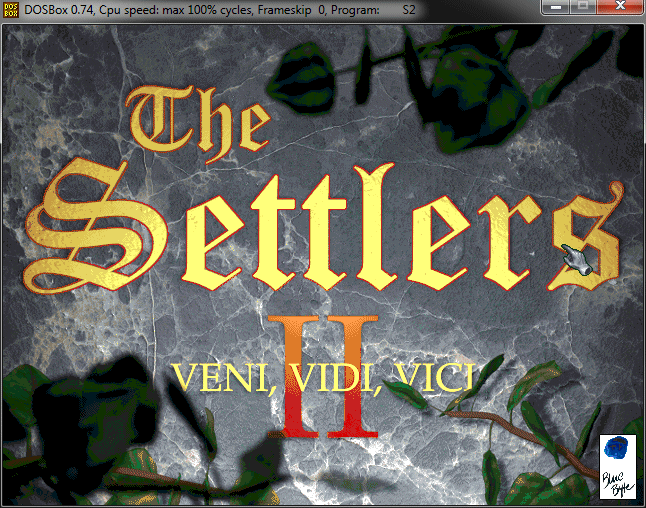 I have multiple versions of The Settlers II installed, so that is why I have both Settler2 and SET2DEMO directories. Anyway, the first thing to do is to run setup. This lets you setup music and sound. 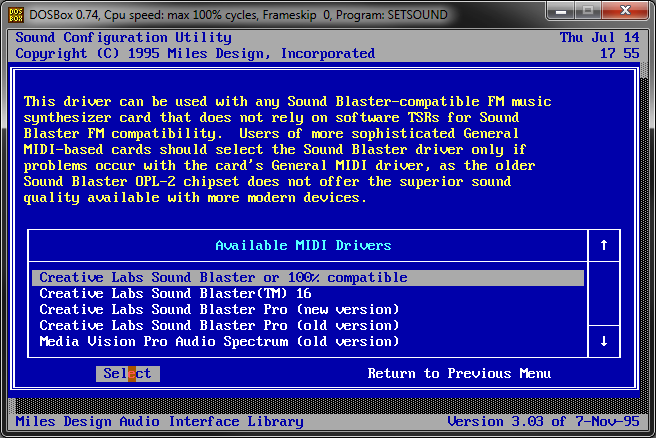 You don’t really need to do much here, just first go to select MIDI for music and make sure you select Creative Labs Sound Blaster or 100% compatible. This same selection also works for setting up digital sound. Once the setup is complete you can exit and quit the graphical setup screen, you’re told to enjoy the game (which you will!) and then you can simply launch the game by writing S2. For me the game ran perfectly fine with the default DOSBox settings, so I didn’t need to change anything. For a more complete tutorial to get DOSBox running you can reference Basic Setup and Installation page at DOSBox wiki. Happy gaming! Hello – are you able to post instructions to get splitscreen working with 2 mice? Using the GOG version or otherwise? That would be most appreciated! I’ve been experimenting with two player setup on my oldest computer, but unfortunatenaly I think I hit a roadblock of incompatibility of some sort. Or my very old serial mouse just doesn’t work anymore. Anyhow, I didn’t get Windows or the game to recognize my mouse so that has slowed me down quite a bit. For one, I don’t have that many computers with a serial port! I don’t know if DOSBox gives you the ability to use a secondary mouse for second player… it is quite unique multiplayer feature so I guess they won’t be implementing that anytime soon. What I’ve heard though is that there is a passthrough feature that allows one to use a real serial mouse in DOSBox so that shouldn’t be a problem if you just have a working mouse and a computer with a COM port. Oh well, I’ll experiment and investigate this more later. I did it sometime in the past but didn’t document how I did it. i have the windows version. any advice on getting that working? Now, after installation and you want to save it so you can return to where you last played, how to access the saved game? Reinstalling deletes saved games. I am tired of playing the first level all the time. All I have to do is build a gold smelter, a gold mine and a couple of barracks and it’s all over.